Without a doubt one of the highlights of our annual beach trip was to go to Myrtle Beach for the rides. 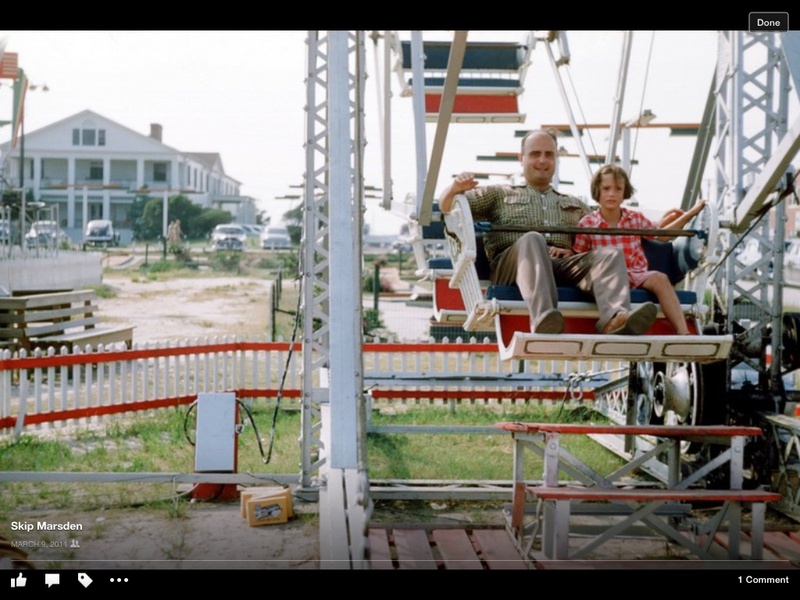 When we were young, Mom and Dad would drive us down in the late afternoon, buy a few tickets, and take us on the kiddy rides — innocuous rides like the Ferris wheel or merry-go-round. An hour later, maybe more, we drove back to the cottage and that was it for another year. But, we grew older, and began to murmur that we should be allowed to go to the rides later and to stay later. No more were the tame kiddy rides okay with us. We set our sites on rides like The Tilt-a-Whirl, The Round Up and the Wild Mouse. The Tilt-a-Whirl was a two-person half shell-like ride that spun and careened on a wave-like floor with dozens other shells that came close to crashing into each other. The Round Up was a large round platform with cages along the outside edge. Riders stood in the cages (open in front) with their backs against the mesh wire back. The platform would begin to spin faster and faster, centrifugal force pinning riders against the mesh. Then the platform would rise in the air until it was almost perpendicular to the ground. The Wild Mouse was a roller coaster on a very narrow track. Individual cars would slam through the course. The rollers on each car were positioned back from the front so that when you went into a hairpin turn, you thought you were going to go over the edge! So, we did that one year — rode those rides while Mom and Dad waited for us to get tired. Three hours later we limped back to the cottage. The very next year on rides night, Mom cooked up a big batch of spaghetti and meatballs. Once in Myrtle, Dad bought a handful of tickets. He said he wanted to take movies, and the sky hadn’t got so dark as to impede the filming. So, like dutiful lambs, we trotted onto the round platform and backed into our cages. The operator came around to make sure the thin little link chain, that would supposedly keep us safe, was fastened. Then it began. Slowly turning around. Faster and faster and faster. Suddenly a jolt as an armature under the platform began to slowly tilt the ride into a vertical position. God! I couldn’t find anything to focus on! So, I closed my eyes. Spinning around at what seemed like a thousand miles per second, and not able to lift my head from the back of my cage, I screamed out loud. No one ever hears you scream at the rides. That’s because everyone else is screaming, and the music from a dozen rides has blurred everyone’s hearing. Suddenly I felt my heart rising slowly though my stomach, and knew if I didn’t keep my mouth shut, it would fly out of my body. Wait. That’s not my heart! It’s dinner! Spaghetti and meatballs — two large servings! And like hot lava it wanted to spew! Very large metal trash barrels were strategically placed near the exits of The Round Up, and The Tilt-a-Whirl and The Wild Mouse. Three green-faced siblings staggered off the ride and made stops at those barrels. “How ’bout The Tilt-a-Whirl next?” asked my dad in an encouraging voice. The answer was loud and unanimous: NO!!!!! To this day the only rides I’ll do are the kiddy rides — which definitely looks a bit odd. I don’t care how it looks.